A serene and tranquil view in a Provençal town on a hot, still afternoon, this is closely based on Samuel Peploe’s A street scene in France, c.1910, private collection. It probably shows the small town of Cassis, near Marseille in the south of France; Peploe had been so taken by Cassis that he had visited it twice on painting holidays. 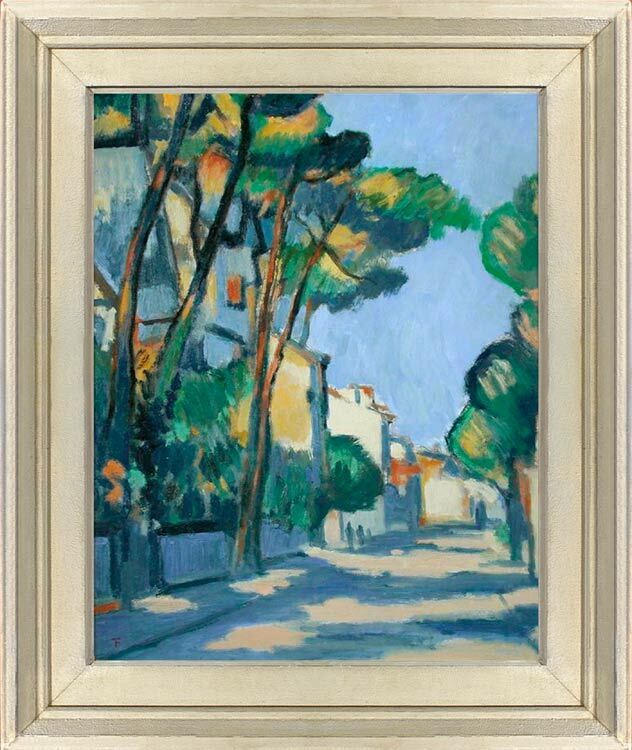 Flanagan’s version of this scene is, in some ways, more naturalistic than Peploe’s – his colours are quieter and less hectic, preferring softer blues and greens where Peploe has opted for pure ultramarine, and endowing his painting with a Cezanne-esque air. An evocative image, this captures the sun-drowsed atmosphere of a summertime in the south of France. Very little is known about Tom Flanagan, although works by him occasionally surface in provincial salerooms. He cannot be synonymous with the young video artist active in the Enso group c. 2005, nor with the older Canadian artist of the same name. He may be a trained or self-taught amateur artist; he may have been born or possibly still lives in Scotland, since the painters he chooses to copy seem to be mainly Scots: not only the colourists, Peploe and Cadell, but the contemporary artist Jack Vettriano, whose Singing butler he has reproduced. He has painted versions of Cadell’s The eagle mirror, The black hat and Ben More from Iona, and his Still life with roses and fruit is based on an amalgam of flowerpieces by Samuel Peploe. It is possible that he either works for, or haunts the auction houses, where high resolution images of his models, not to mention the works themselves, would be readily available. His Going down Chantilly is closely based on Alfred Munnings’s Mr Vlasto’s Mackwiller, with Jennings up, at Chantilly, which was sold for nearly 2 million dollars by Christie’s New York in May 2002. He has also painted landscapes with cattle, after Sir Alfred Arnesby Brown. He is not a forger, however; his work is always firmly signed in the bottom left-hand corner, in red capital letters.